Ok, so we finally loaded up all our stuff into the biggest U-Haul money can rent, and headed north to the sunny climes of Boise, ID. While the drive for me was mostly uneventful (except for when the car hauler behind the truck started fishtailing and whipping the back of the truck around – that was fun) it was pretty hectic the whole time for Christine – what with 3 kids below the age of 5 trying desperately to have her seriously consider driving the car off the next cliff and all. We pulled up on Wednesday afternoon and Cameron and I started unloading all our stuff. A kind neighbor showed up a few minutes later, and Cameron later went and recruited his scout troop to come and help. Christine arrived a short while later after dinner, etc at Cameron’s house. So, the truck is unloaded and returned, the house is beginning to look like a home, and I finally took a shot and plugged in the DSL modem and servers etc. Looks like I’m not getting the speed I’m supposed to be getting, but my domain is in process of moving to its new home, and in a day or 2 will have propagated everywhere. 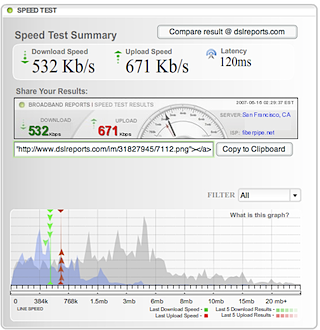 I guess I’ll have to call the DSL company on Monday to figure out why my speed is piddly.